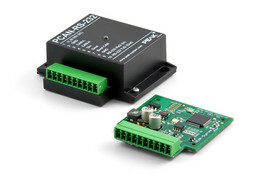 PCAN-RS-232 is a programmable module for the communication between RS-232 and CAN. The conversion of data traffic is done via a NXP LPC21 series microcontroller. Using the supplied library and the Yagarto GNU ARM toolchain (contains the GNU Compiler Collection GCC for C and C++), custom firmware can be created and then transferred to the module via CAN. This gives a whole range of options for manipulation, evaluation, filtering, and routing of the data traffic. On delivery the PCAN-RS-232 is provided with a demo firmware that routes from CAN to RS-232 and vice versa. It allows to configure the data transfer as well as the hardware with serial control commands. The corresponding source code is included as an example in the scope of supply. The transfer of the firmware via CAN requires a PEAK CAN interface.